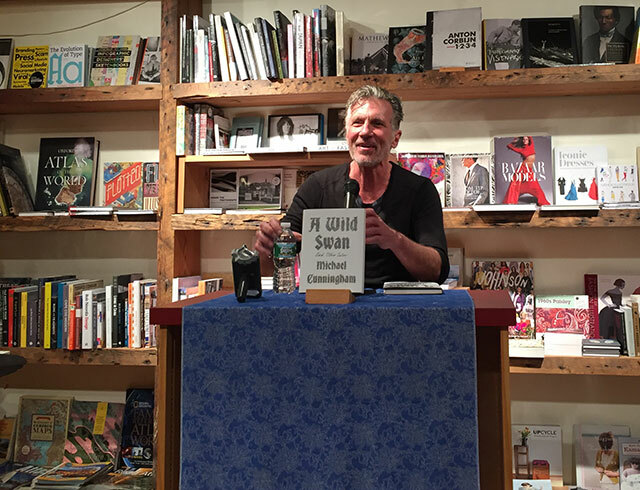 Michael Cunningham read from his latest book, A Wild Swan, a collection of short stories at BookCourt in Brooklyn. He brought him his friend and musician Billy Hough. Hough’s musical composition accompanies the audio book version of the collection. The story collection reimagines classic fairy tales. The idea originated in Cunningham’s childhood when his parents would read to him. He describes himself as a child as a junkie for stories. However, the fairy tales were never enough for him. Cunningham wanted to know what happened after the happily ever after. “What if the princess gets to the castle and doesn’t like it?” he asks. Cunningham’s previous novel, The Snow Queen, was in galleys several years ago while he vacationed in Provincetown, Massachusetts. He needed something new to work on. He started writing the fairy tales based on his favorites as a child. One of the earliest people to have heard the stories as Cunningham interpreted them was Billy Hough. They were both on Cape Cod when Cunningham first started crafting the stories. Hough had helped Cunningham with, The Snow Queen. That book includes a composer as a character, and Cunningham needed help. Hough gave Cunningham a quick lesson to get the buzzwords accurate and create an authentic character experience. “Music is entirely mysterious to me,” Cunningham says. Hough wrote a soundtrack in response to the stories. It was a gift for Cunningham, but they are thematic to each story. Cunningham says there was not much methodology to the stories he chose to reinvent; they were simply the stories he liked most as a child. As it turns out though, those stories are the one that seem to have the most missing. They are stories that are short on motivation. For instance, Jack and the Beanstalk has Jack climbing up the beanstalk three times before grabbing the goose. The Giant’s wife keeps letting him in. There had to be a reason, there had to be something wrong with that marriage. There is no such thing as an ordinary childhood, Cunningham says. But his on the surface at least appeared to be. He grew up in Pasadena. 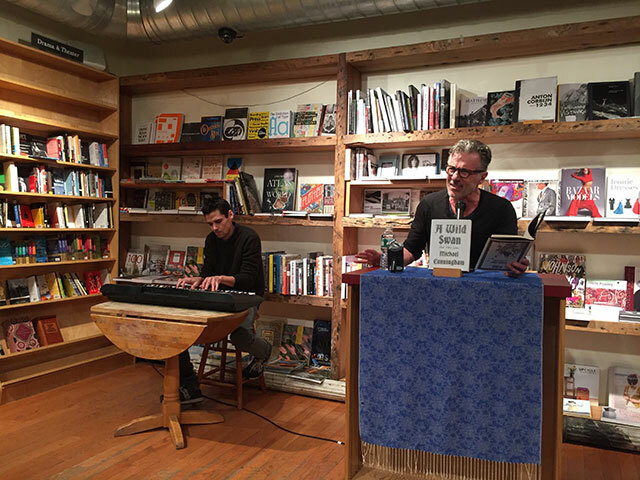 “I don’t know why I wanted to write,” he says. He was originally trying to become a painter. That didn’t work out. The fundamental problem of fiction is simulating life with words and paper, he says. He finds that process intriguing. Writing requies creativity combined with the ability to sit in the chair to write. Cunningham is perhaps most famous for writing The Hours, a novel inspired by Mrs. Dalloway. He says he didn’t have any idea what was going on in Mrs. Dalloway but that he found the language to be amazing. Woolf was doing with language what Jimi Hendrix was doing with guitar. Every reader has a book that shows them the possibility of fiction, he says, that was his.